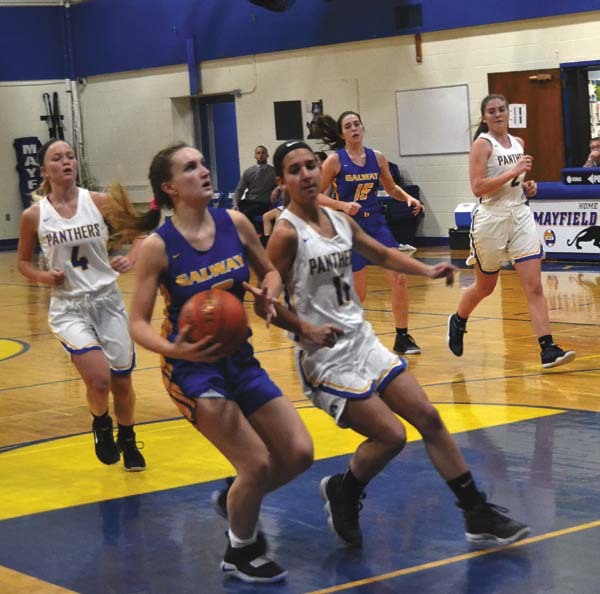 MAYFIELD — Defense is a focal point each game for the Mayfield Lady Panthers and it showed in their 38-27 non-league victory over the Galway Golden Eagles on Wednesday night at Mayfield Central School. It was a seven-point lead for Mayfield heading into the fourth quarter. That is when the defense for the Lady Panthers showed their teeth as they held Galway to only two points in the final quarter. In that fourth quarter, Mayfield would use the effort provided by Lindsey Hampton as she would score four of Mayfield six fourth quarter points to close the game. Hampton would lead all scorers with 13 points. Mayfield would waste no time as they blitzed the Lady Eagles with a 7-0 run to start the game with Hampton scoring seven of her 13 points. After a timeout at the five-minute mark to stop the bleeding, Galway would respond and end the quarter on a 9-5 run with the help of Ryan Repepi’s five-point contribution. In that first quarter the Eagles would lose starter Julia Reedy and would then turn to bench to pick up the slack. The bench for Galway would add 11 points on the night. “We’ve got a big roster and with a few injuries we really did rely on our bench and what they provided for us tonight,” said Galway head coach Phil Meashaw. The second quarter was dominated by the post-presence of Mayfield’s Katie LaGrange, as she would score six-straight points for the Lady Panthers, with each basket coming off of putbacks from missed shots. She would end the night with 10 points. Coming out of the locker room at halftime down by seven, Galway’s Emma Smith tried to muster up a comeback as she poured in five of her team’s seven third quarter points. She would end the night with a team-high seven points. However, Mayfield would share the wealth and use the scoring of four separate players to build a small yet comfortable lead heading into the final quarter. “I got a good group of seven and we are going to work to get back to that defensive mentality that we had versus Warrensburg and keep this momentum from this game forward,” Moore said. For Mayfield, they improve to 2-1 on the year and will also hit the road Friday night to battle Notre Dame Bishop Gibbons in Schenectady. Mancini 1-1-3, Smith 3-0-6, Reedy 1-0-2, Grant 1-2-4, Ripepi 2-1-6, Bishop 1-0-2, Reichard 2-0-4. Totals 11-4-27. LaFontaine 1-0-2, Hampton 4-4-13, Miller 1-0-2, Meca 1-3-6, LaGrange 4-0-8, Hubiak 3-0-7. Totals 14-7-38. 3-point goals: Galway 1 (Ripepi); Mayfield 3 (Hampton, Meca, Hubiak). ST. JOHNSVILLE — Rebecca Trumble finished with a game-high 17 points to lead Oppenheim-Ephratah/St. Johnsville to a WAC victory over Notre Dame-Bishop Gibbons. 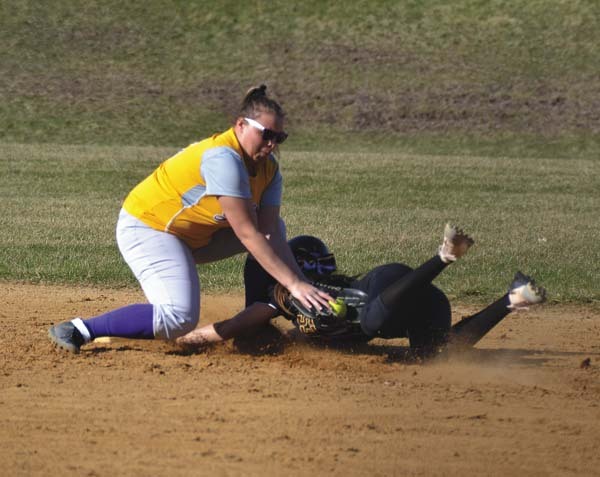 The Lady Wolves outscored the Golden Knights 17-11 in the fourth quarter to earn the win. Alexis Klock scored 10 points for OESJ (1-2 overall, 1-0 WAC), while Ashlee Shelmandine and Fontana LaCoppola each had eight points. Abby Kienzle scored 10 points to lead Bishop Gibbons. Jackson 1-2-4, M. Kienzle 1-0-3, Megyeri 3-1-8, A. Kienzle 4-1-10, Bessinger 0-1-1, Relyea 34-0-9, Ford 2-0-4, Santiago 1-0-2. Totals 16-6-41. Eggleston 0-2-2, Klock 4-1-10, Trumble 7-3-17, LaCoppola 3-2-8, Shelmandine 4-0-8. Totals 18-8-45. SCOTIA — Maraya Davis scored 24 points to help Mekeel Christian Academy to a WAC victory over Fonda-Fultonville. Jillian Ballard scored 11 points for Mekeel Christian. Abigail Lombardoni scored 20 points to lead the Lady Braves (3-2 overall, 0-1 WAC), who had their three-game win streak snapped. Duval 3-1-6, Wilder 1-0-2, Lombardoni 9-0-20, Atty 1-0-2, Smith 2-0-4, Whitcavich 4-0-8. Totals: 20-1–42. Mills 4-0-9, Lilienthal 2-0-5, Show 2-0-5, Ballard 5-1-11, Davis 10-0-24. Totals: 23-1-54. 3-point goals: Fonda-Fultonville 3 (Lombardoni 2, Duval); Mekeel Christian 7 (Davis 4, Lilienthal, Mill, Show). 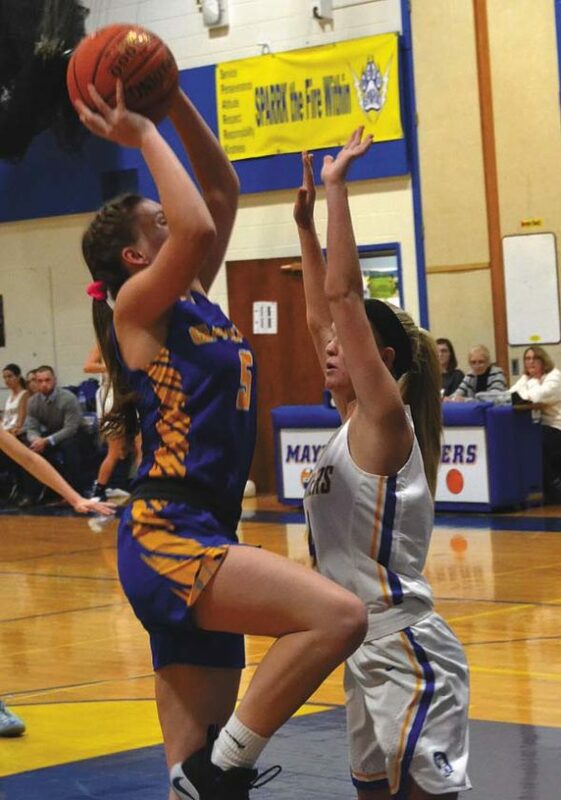 CANAJOHARIE — Mackenzie Bowerman scored 22 points to lift Canajoharie to a WAC victory over Northville. Alexz Lathers added 14 points for Canajoharie, which outscored the Lady Falcons 39-12 in the second half. Mollie Krug scored 10 points for the Lady Cougars (2-1 overall, 1-0 WAC). Kerrigan Groff scored 12 points to lead Northville (2-1 overall, 0-1 WAC). Frasier 1-0-3, Forsey 2-0-4, Ginter 1-0-2, Moore 0-2-2, Grotz 4-4-12, Mackey 2-0-4. Totals 10-6-27. Bowerman 9-3-22, Yacobucci 1-1-3, Hartlieb 2-2-7, Krug 4-1-10, Rickard 2-0-4, Lathers 7-0-14. Totals 25-7-60. 3-point goals: Northville 1 (Frasier); Canajoharie 3 (Bowerman, Hartlieb, Krug). 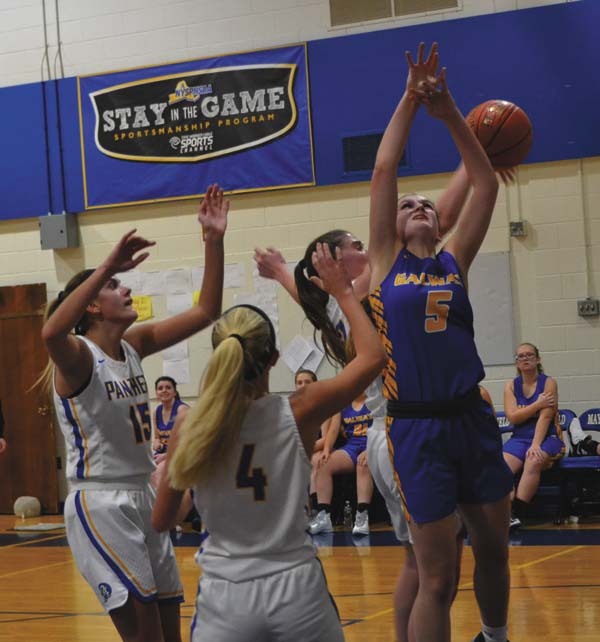 DUANESBURG — Madison Meyer scored 29 points to lead Duanesburg to a Western Athletic Conference victory over Middleburgh. Allison O’Hanlon finished with 18 points for the Eagles, who improved to 3-0 overall and 1-0 in WAC play. Kelsey Terrell scored 20 points to lead Middleburgh. Palmatier 3-1-8, Bynum 0-1-1, Wayman 1-0-2, M Terrell 2-1-7, K Terrell 8-3-20, Geesner 1-0-2, Brown 2-1-5. Totals 17-7-45. Stealey 2-1-5, Cole 0-1-1, Meyer 12-3-29, O’Hanlon 8-0-18, Meyer 3-1-7, Quiernan 1-0-2. Totals 26-6-62. 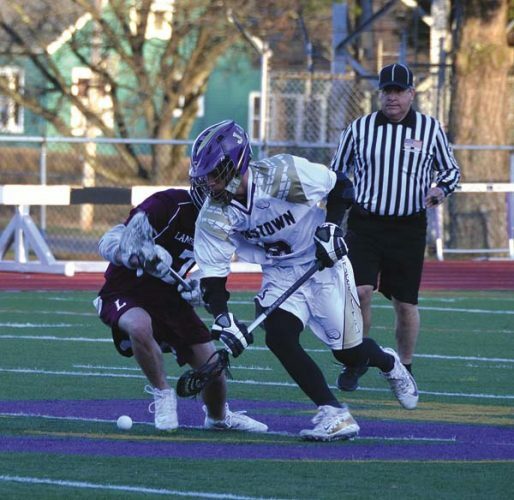 3-point goals: Middleburgh 4 (M. Terrell 2, K. Terrell, Palmatier); Duanesburg 4 (Meyer 2, O’Hanlon 2). SCHOHARIE — Taylor Meacham finished with 21 points to lead Berne-Knox-Westerlo to a WAC victory over Schoharie. Alexis Wright netted 14 points for the Bulldogs, while Reagan Smith added 12 points. Alexis Williams scored 19 points to lead Schoharie, while Julie Lehoe finished with 11 points. Lendrum 1-0-2, Meacham 8-0-21, Morrow 1-0-3, Smith 6-0-12, Tymchyn 2-0-4, Wright 5-4-14. Totals 23-4-56. Cater 2-3-7, Fagnani 1-0-2, Lehoe 3-2-11, Towle 0-1-1, Vangasbeck 2-0-4, Williams 6-7-19. Totals 14-13-44. 3-point goals: Berne-Knox-Westerlo 6 (Meacham 5, Morrow); Schoharie 3 (Lehoe 3). NEW YORK MILLS — Hannah Stack finished with 23 points and 20 rebounds to lift Dolgeville to a victory over New York Mills. Sandra Gonyea had 10 points, six rebounds, four assists and two steals for the Blue Devils, while Ryanne Williams had 10 points, eight rebounds and three assists. Isabella Nichols added eight points and eight rebounds for Dolgeville (4-0 overall). Abbey Copperwheat had 23 points to lead New York Mills, while Jenna Jordan had 15 points. 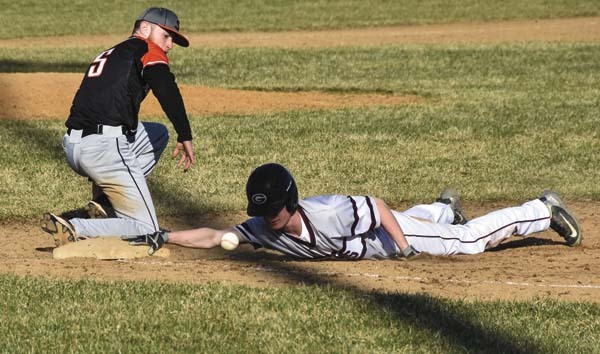 Dolgeville is scheduled to host Canastota on Friday at 7 p.m.
Gonyea 3-2-10, Williams 3-4-10, Spofford 2-1-5, Vanasse 0-1-1, Stack 11-1-23, Lamphere 2-0-4, Nichols 2-4-8. Totals 23-13-61. Copperwheat 9-2-23, Stevens 1-0-2, Kat. Osika 1-0-2, Keator 1-3-5, Taylor 3-0-7, Jordan 5-5-15. Totals 20-10-55. 3-point goals: Dolgeville 2 (Gonyea 2); New York Mills 5 (Copperwheat 3, Taylor, Kat. Osika). HUDSON FALLS — Brinley Inglee scored 23 points to lead Hudson Falls to a Foothills Council victory over Glens Falls. Sovereign Strickland scored 14 points and Anna Bayle added 11 for Glens Falls. Cutter 1-0-3, Benway 1-0-2, Bayle 5-0-11, Williams 1-3-5, Strickland 5-2-14. Totals 13-5-35. Inglee 9-2-23, Phillips 2-3-7, Varney 1-0-2, Davis 2-0-4, Casey 2-0-4. Totals 16-5-40. 3-point goals: Glens Falls 4 (Strickland 2, Bayle, Cutter); Hudson Falls 3 (Inglee 3).